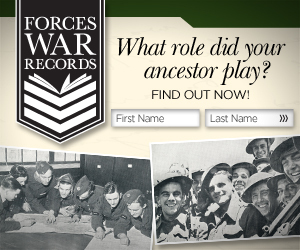 Wenches In Trenches are a volunteer group of ladies with an interest in World War One and are raising the profile of women of the Great War. Their aim is to raise funds for UK military and medical causes, and to honour the memories of nursing staff and medics who served alongside our troops in all conflicts, past and present. Some, like Beverley Gall, are former members of the QARANC. She knows more than most about the sacrifices of serving your country - her husband is still serving and her 16 year old son is about to join the Army. My husband Antony and I are actively involved with our local branch of the Royal British Legion in Hartley Wintney, Hampshire. We live in a beautiful part of England, and 100 years ago so many brave men and women, including young men from our village, made the ultimate sacrifice - laying down their lives for their fellow countrymen. Wenches In Trenches are commemorating the centenary of the start of WW1 with their own poignant campaign: The Roses of No Man's Land. 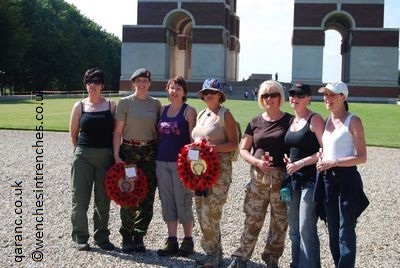 During the weekend of 13th & 14th September 2014, fifteen women will be walking the battlefields of Ypres dressed in the uniforms of Voluntary Aid Detachment and nurses of the Great War, each walking in memory of nurses involved in the conflict, and paying their respects at the many war cemeteries on route. The walk - entitled 'The Roses of No Man's Land' - culminates on Sunday 14th September with a wreath laying ceremony at the Menin Gate war memorial, dedicated to the British and Commonwealth soldiers who were killed in the Ypres Salient of WW1, and whose graves are unknown. The Roses of No Man's Land walk is going to be really, really special, said Beverley, not just because of the centenary but because of what we do - a great bunch of women from all walks of life, cherishing the memory and work and dedication of nurses, VADs and other medical staff. This is particularly special to me as I was a Combat Medic with 257 General Hospital (TA) and my regiment was the Queen Alexandra's Royal Army Corps. I will be wearing a replica Queen Alexandra's Imperial Military Nursing Service uniform. The Wenches are each walking in memory of a named nurse who served in the Great War. Beverley will be walking in memory of QAIMNS Matron in Chief of the BEF France and Flanders Dame Maud McCarthy, in Beverley's view: A legend of a woman! All the Wenches walkers are raising sponsorship and the funds raised will be used to honour the memory of nurses and VADs that served in WW1. This forms part of a wider programme of events that will take place 2014-2018. 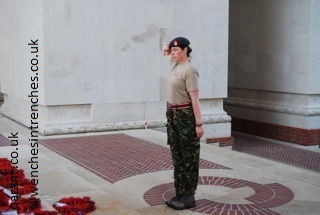 Below is a photo of Beverley taken during their last walk in 2012 at The Somme where she laid a wreath at the Thiepval Memorial.